Yesterday’s press news about the sad passing of “The Last of the Few” Canadian pilots participating in the Battle of Britain, Dal Russel, brought a quick reaction from one of our contributors, Pat Murphy. His photo and accompanying short story is among one of the three images added today in the Historic Photographs section. There’s also a correction to be made, and I’m glad to see that this one comes through a commenting feature in our Historic Photographs section (which, by the way, is open for everyone to use). Andy Ingham, a historian of No. 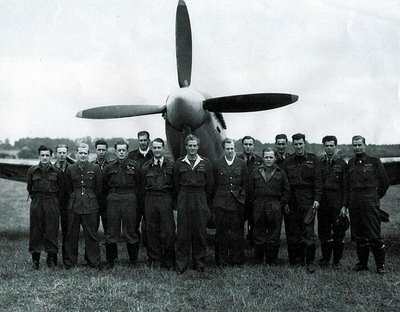 127 Squadron, pointed out that the Spitfire Mk. XVI depicted on this photograph is not, in fact, 9G-V of No. No. 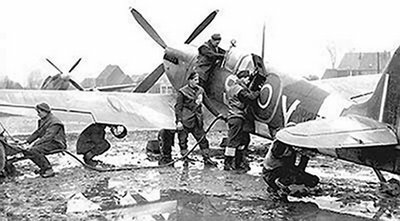 441 Squadron RCAF, but rather 9N-Y of 127 Squadron, photographed at Grimbergen, Belgium. Looking at the photo it is easy to see that the margin between the two interpretations (and I have quoted mine relying on the photo caption at Public Archives of Canada) is very narrow indeed. Highly interesting; thanks Andy for clarifying this!